“To be grow Taj Dearob Pharma to become a reputable, global pharmaceutical company, providing quality medicines at affordable prices”. Taj Dearob Pharma through its corporate activities, contributes to the improvement of regional living conditions and social prosperity and, in turn, strives to offer products and services that are clean, safe and of high quality. Facilitating access involves helping people command appropriate healthcare resources in order to preserve or improve their healthcare. If services are available and there is an adequate supply of services, then the opportunity to obtain healthcare exists. It also depends on financial, organisational and social or cultural barriers that limit the utilisation of services. Ethnic minorities and people of low socioeconomic status (SES) are disproportionately represented among those with access problems. “Provide affordable, quality healthcare products without affecting the quality of our products”. Taj Dearob Pharma respect the laws of the countries it supplies to around the world. It strives to operate in the spirit of the pharma industry regulations and to be fair and transparent in how we manufacture and supply our medicines. Taj Dearob Pharma, through its corporate activities, contributes to the improvement of regional living conditions and social prosperity and, in turn, strives to offer products and services that are clean, safe and of high quality. Taj Dearob Pharma conducts extensive product research and forward looking development activities to ensure new value products for its customers. 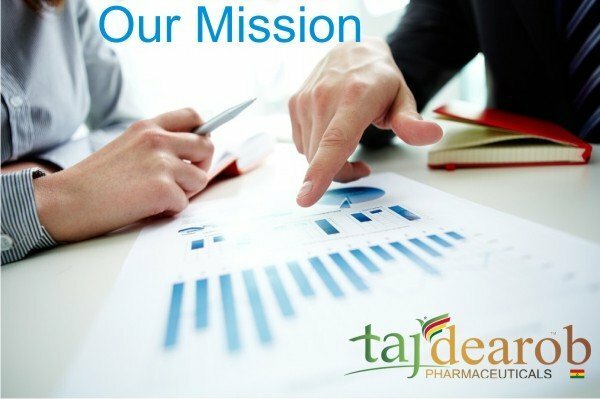 Vision & Mission – Taj Dearob Pharma | “To be grow Taj Dearob Pharma to become a reputable, global pharmaceutical company, providing quality medicines at affordable prices”. Taj Dearob Pharma through its corporate activities, contributes to the improvement of regional living conditions and social prosperity and, in turn, strives to offer products and services that are clean, safe and of high quality. Facilitating access involves helping people command appropriate healthcare resources in order to preserve or improve their healthcare.Vision & Mission – Taj Dearob Pharma | “To be grow Taj Dearob Pharma to become a reputable, global pharmaceutical company, providing quality medicines at affordable prices”. Taj Dearob Pharma through its corporate activities, contributes to the improvement of regional living conditions and social prosperity and, in turn, strives to offer products and services that are clean, safe and of high quality. Facilitating access involves helping people command appropriate healthcare resources in order to preserve or improve their healthcare.Vision & Mission – Taj Dearob Pharma | “To be grow Taj Dearob Pharma to become a reputable, global pharmaceutical company, providing quality medicines at affordable prices”. Taj Dearob Pharma through its corporate activities, contributes to the improvement of regional living conditions and social prosperity and, in turn, strives to offer products and services that are clean, safe and of high quality. Facilitating access involves helping people command appropriate healthcare resources in order to preserve or improve their healthcare.Vision & Mission – Taj Dearob Pharma | “To be grow Taj Dearob Pharma to become a reputable, global pharmaceutical company, providing quality medicines at affordable prices”. Taj Dearob Pharma through its corporate activities, contributes to the improvement of regional living conditions and social prosperity and, in turn, strives to offer products and services that are clean, safe and of high quality. Facilitating access involves helping people command appropriate healthcare resources in order to preserve or improve their healthcare.Vision & Mission – Taj Dearob Pharma | “To be grow Taj Dearob Pharma to become a reputable, global pharmaceutical company, providing quality medicines at affordable prices”. Taj Dearob Pharma through its corporate activities, contributes to the improvement of regional living conditions and social prosperity and, in turn, strives to offer products and services that are clean, safe and of high quality. Facilitating access involves helping people command appropriate healthcare resources in order to preserve or improve their healthcare.Vision & Mission – Taj Dearob Pharma | “To be grow Taj Dearob Pharma to become a reputable, global pharmaceutical company, providing quality medicines at affordable prices”. Taj Dearob Pharma through its corporate activities, contributes to the improvement of regional living conditions and social prosperity and, in turn, strives to offer products and services that are clean, safe and of high quality. Facilitating access involves helping people command appropriate healthcare resources in order to preserve or improve their healthcare. 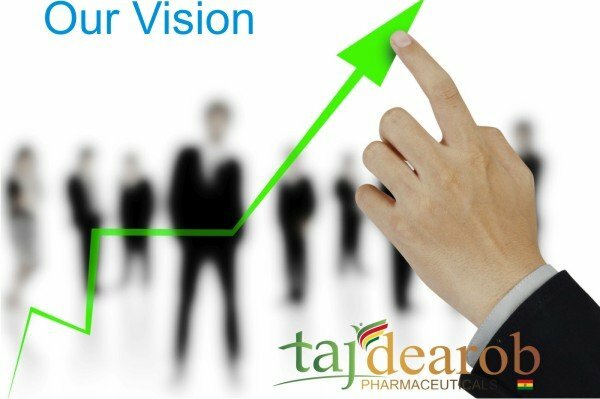 Vision & Mission – Taj Dearob Pharma | “To be grow Taj Dearob Pharma to become a reputable, global pharmaceutical company, providing quality medicines at affordable prices”. Taj Dearob Pharma through its corporate activities, contributes to the improvement of regional living conditions and social prosperity and, in turn, strives to offer products and services that are clean, safe and of high quality. Facilitating access involves helping people command appropriate healthcare resources in order to preserve or improve their healthcare.